Bartol the Cragmaker sees invisibility and Shroud of Stealth. A chest spawns upon this mob's death. This page last modified 2015-05-07 11:23:16. Sees through shroud of stealth. anyone know if bartol and titanothon are bugged atm, have killed both and no chest, no bones. Doesnt seem like sony cares either. We've killed this guy numerous times with 2 groups and the other night with a full raid - sometimes with some of the adds dead, all of them, and none of them. We can't get a chest to pop off him. What's the deal? wait. /guidehelp comman is suposed to wake a gm up and get him/her to help you with quests/event. Actually, /guidehelp will get you a guide (who can't really help with mobs issues like chest not spawning). The petition window is the only way to get to a GM (eventually). Whats up with the chest? We killed this mob the beginning of Nov, 2006. We've killed him numerous times in the past and never had a problem. This time, it would not let anyone in the raid open the chest to loot the bones. When trying to open it, we got some garbage about us "not being worthy to rummage through these bones" or some such junk. What is going on now? I petitioned, and this is the response I got. No, I can't make any sense of the response either. Maybe someone can enlighten me?? Thank you for contacting Sony Online Entertainment, this is GM Zinchar. not increase or decrase any factions as well. Feel free to discuss the issue in eqforums for better understanding. If you face any other in game issue then please feel free to contact us again. I like to thank you for your patience and understanding. 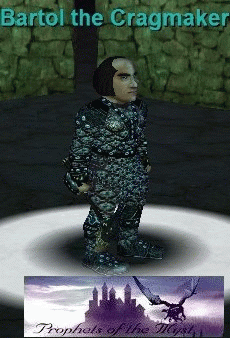 Good Luck and Safe Travels in the world of Norrath. The best thing about hitting your head against a wall, is that it feels good when you stop!! What's this guys location corrdinates? He dropped this the other day "Engraved Earring of Endless Rage"
Added the items. Are you saying that this chest works like the chest for the Sverag bosses, where any of several bosses can spawn the same chest with the Legendary Berserker Bone (bold invader)? If so, does Titanophon spawn the same chest or a different one (one that drops Legendary Berserker Bone (massive bazu))? You have the 2 reversed as who drops them. As far as i know the bone from the chest of Titanothon is unique and is the only source for the massive bazu bone. Vooersalor, Bartol and possibly other bosses of Devastations factions share a chest with the invader bones.